Over 10, buy 000 years ago in the mountains of ancient Böd, ask before the Himalayas were known by names such as Tibet, bronchitis an ancient civilization was dedicating its existence to the study and development of this Science and Art for Eternal Youth. This Physical and Psychological system has been kept in secrecy for millennia. Through this book, for the very first time ever, secrets of this Art have been disclosed, but only the very tip of the iceberg. 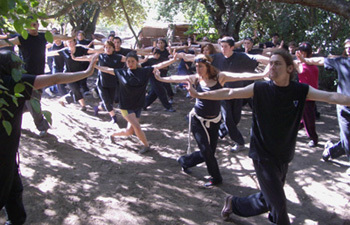 This text, complemented by more than 200 illustrations and diagrams, is a practical, dynamic, and fun introduction to these teachings so long studied in the loneliness of the mountains, by monks and hermits devoted to cultivating their powers of pranic vitality, to the harmony of their movements, and the discovery of internal powers of self-healing that improve and extend life. For any who are curious about ways to develop a balanced body and mind, this manuscript is a unique and vital document. Its value is inestimable in an era such as ours, where we are always looking for alternate ways to overcome stress and disease. This book is the beginning of a journey towards a long life full of awareness, vitality, and energy. The Art presented in this volume is a technique of relaxation and self-medicine through Movement based on a millenarian tradition of Tibetan origin for the longevity. At the present time, Asanaro has developed and systematized this system into two major stages: the Art of Awakening and the Art of Active Relaxation (or Seamm-Jasani itself). The Secret Art of Seamm-Jasani presents this Art in a course that is simple to understand, yet will challenge all of its readers. 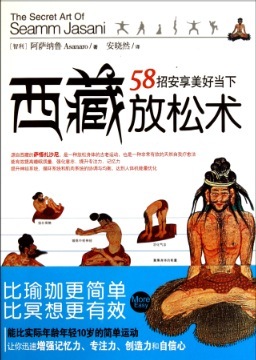 The course is presented in a simple and amusing manner, as text, illustrations and diagrams acquaint the reader with fifty-eight unique exercises and techniques for meditation. These fifty-eight movements lead us down a diverse and balanced path towards achieving equilibrium in body and mind, where we can channel our internal energies to increase our vitality, happiness, and energy, all of the ingredients needed for Eternal Youth. The testimony of many students of this discipline show the practical value of this ancient Art. 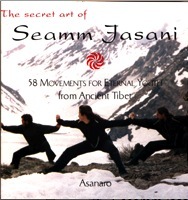 Seamm-Jasani works as a therapeutic, revitalizing method of utilizing movement and breathing to awaken the process of self-healing that exists within every one of us. “In addition to the classes being a physical challenge, they have also had a huge positive impact on me mentally and emotionally”. “Nowadays it is not so often discussed that physical exercise liberates endorphins, substances within our bodies that counteract pain and stagnation throughout the body. Discouragement, sadness, and depression are internal catalysts not only of organic malfunctions (headaches, musular pains, gastritis) but also of more serious ailments such as ulcers, and cancer; thus we should not be surprised that states of happiness, comfort, and enthusiasm have real healing powers over old, chronic ailments that students often bring when they first arrive, causing them to vanish after a while…. Our bodies, even the weakest and most underdeveloped we have seen, are full of potentialities that one may never finish discovering, and are able, with practice, to coordinate themselves in ways we believed impossible. The Seamm-Jasani, with its exercises and coordinations whose origins are lost in the depths of time, in remote places, part of a greater whole…centers again man on himself, takes him out of his exterior world and develops a special sort of body-mind relation, simply called ‘meditation in motion’.